"The wood is from the tree of life, those who embrace her; those who lay hold of her will be blessed." I have the pleasure to review and do a giveaway with Comfort Crosses. When I opened up the nice red velvet bag I was pleasantly surprised at the size of the cross. I had pictured a much smaller cross but this was a nice good size. It can easily be held and carried in a purse or bag without getting lost. Immediately I started thinking about who I could bless with this beautiful cross. There were so many faces that went through my head. The cross is a nice gift for celebrations or a gift to cheer up and give someone hope. Have you started to think about Christmas gifts or a special gift for a dedication, baptism, graduate, or any special occasion? 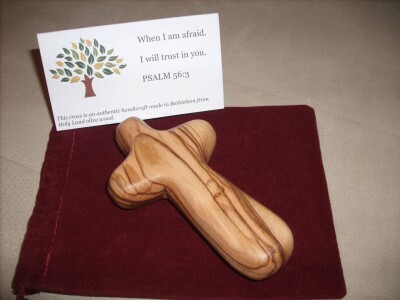 Comfort Cross make a perfect gift with such an amazing message to share but also bless the hands that made them in Bethlehem. Why does and Olive Tree Hold such significance? The olive tree is probably the most significant plant mentioned in both the New and Old Testament. First mentioned in Genesis as teh leaf brought by the dove to comfort Noah it was the tree Jesus prayed under before the last supper. The olive tree also provided food, lamp oil, anointing oil, and building material during ancient times. The olive tree is an evergreen which can grow for many years. The tree admired by Hosea whose leaves have been a sign of abundance;glory and peace ares till used to crown victors in the Olympic Games. The oil from the fruit used to anoint the sick. The olive trees of Jerusalem are prune to remove the hard wood and open the tree so new growth can provide a bountiful crop of olives the next year. That cross would make a great Christmas present. It's neat to see you using rafflecopter too! I found you on Tough Cookie's Monday Mingle. I'm following you now. Stop by when you can. It sure would make a great Christmas gift! Hope you entered! GOOD LUCK!